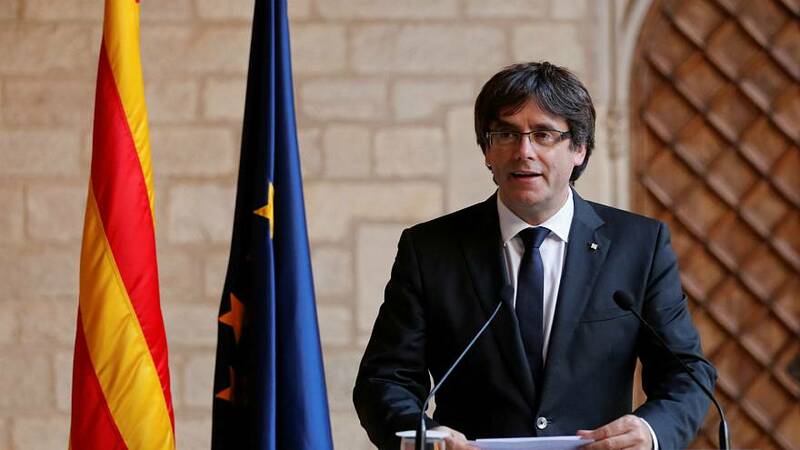 Carles Puigdemont called for a non-violent resistance in a message broadcast on Saturday amid the Spanish government’s push to take charge of Catalonia. The message came after the Spanish government removed Catalonia’s autonomy and put Spain’s Deputy Prime Minister Soraya Saenz de Santamaria in charge of the region. Madrid has sacked Catalonia’s leaders, its police chief and parliament and said there will be fresh regional elections on December 21. Mariano Rajoy, Spain’s prime minister, made the announcment after a special meeting of his cabinet on Friday evening. It comes after Catalonia’s parliament declared independence on Friday afternoon. Spain has sacked the chief of Catalonia’s regional police force, Josep Lluis Trapero. There have been doubts over how the Mossos d’Esquadra, as the Catalan police are called, would respond if ordered to evict sacked leader Carles Puigdemont and his government. In an effort to defuse tensions, an internal note seen on Saturday urged regional police force members to behave in a neutral manner and not to take sides. “Given that there is it is likely to be an increase in gatherings and rallies of citizens in all the territory and that there are people of different thoughts, we must remember that it is our responsibility to guarantee the security of all and help these to take place without incident,” the memo said. What on earth is going on in Catalonia? Is this the constitutional key to unlock the crisis in Catalonia?